immediately add however many blueberries you want to the cakes. Push the berries down into the batter a little. You can even cover the berries with some batter if you want. When the edge of the cakes looks dry and there are bubbles on top, just flip them over and cook until done. You may hear a little sizzling from the berries, but that's just normal. You may keep them warm in a 175 degree oven while you finish cooking the rest. In a large bowl, mix the dry ingredients. In a smaller bowl add all the wet ingredients and mix together. Add the wet to the dry ingredients and mix well with a whisk or wooden spoon, but batter should be lumpy! Don't over mix or pancakes will not be light and fluffy! Add in blueberries, if using, and mix gently with wooden spoon. Batter will be thick. I use a 1/3 measuring cup to scoop up the batter and pour onto a hot griddle, (about 350-375 degrees if using an electric one). 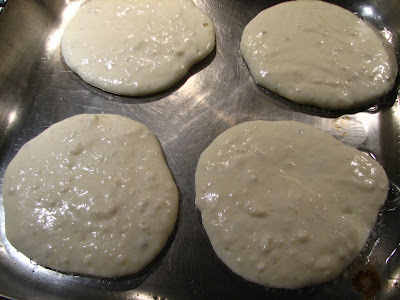 You may have to take a spoon and flatten the batter down a bit, and then let cook until edges are lightly browned and dry looking and there may be a few bubbles appearing on top. Carefully flip the pancake over and cook until done. If the batter gets way too thick, I just add a little regular milk and stir carefully. You may keep pancakes in a warm oven until you're done with all of them, but if your family is like mine, they like them hot off the grill and are standing in line for the freshest ones! This made about 4 inch diameter pancakes. If you want larger cakes use a larger measure. 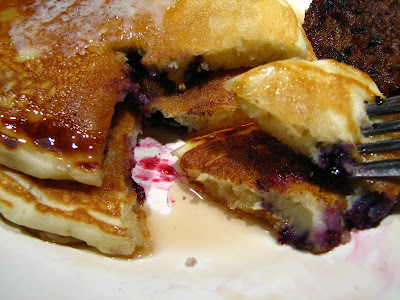 No matter what size they are, these blueberry pancakes are melt in your mouth goodness! Do you make pancake and what do you call them? I've heard them called hot cakes, griddle cakes, flap jacks, pancakes; are there other names you've heard? Let me know! I'm sorry that some of you had trouble leaving a comment; there was a glitch of some kind and my smart son figured it out!Seems to be fine now. 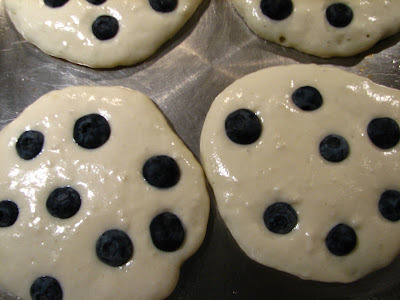 Your pancakes look scrummy, what a great way to use up those blueberries. Being English, I love the European style pancakes called crepes. Hi Lynda, I've given you an award. Stop by the blog and collect it sometime.